Sunderland defender Papy Djilobodji will miss the next four matches after being found guilty of violent conduct. 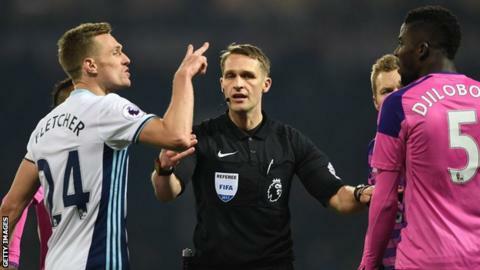 The 28-year-old had denied a Football Association charge following an incident in which his arm struck the face of West Brom's Darren Fletcher in his side's 2-0 defeat on Saturday. But the Senegalese was found guilty by an Independent Regulatory Commission hearing on Friday. The incident was not seen by the match officials but was caught on video. Former Chelsea player Djilobodji had the ban extended by one game having been sent off once already this season - against Hull on 19 November. He will miss the home game against Tottenham on 31 January, followed by Crystal Palace (away), Southampton (home) and Everton (away).